IT due diligence in healthcare involves unique considerations related to the security and privacy of patient data. Alzhan Development LLC, publisher of the IT Due Diligence Guide, has released a new white paper: "How the HIPAA Security Rule Impacts IT Due Diligence in Healthcare." The healthcare industry in the United States has seen a tremendous amount of M&A activity in the past few years. A recent survey of healthcare executives found that this trend is expected to continue. In addition to the need for the usual best practices, IT due diligence in healthcare involves unique considerations related to the security and privacy of patient data. The HIPAA Security Rule, which establishes standards and requirements related to the storage and transmission of electronic protected health information, increases the risks and costs of working with this data. 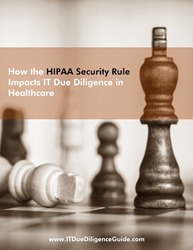 Proper IT due diligence of healthcare providers and vendors requires a solid understanding of the HIPAA Security Rule, and must include a deeper dive into the technology issues related to the Rule. This will lead to a full understanding of the target’s level of compliance with the Rule and bring to light the need for any additional resources before an acquisition is completed. Jim Hoffman wrote the IT Due Diligence Guide after years of technology and operations experience with companies very active in healthcare M&A. He’s worked on IT due diligence projects ranging from a $50,000 investment to a $375M company sale. The tools, information and practices outlined in the book are exactly what he uses himself when he runs due diligence projects.